“To the efficacy and permanency of your Union, a government for the whole is indispensable. No alliance, however strict, between the parts can be an adequate substitute; they must inevitably experience the infractions and interruptions which all alliances in all times have experienced. Sensible of this momentous truth, you have improved upon your first essay, by the adoption of a constitution of government better calculated than your former for an intimate union, and for the efficacious management of your common concerns. This government, the offspring of our own choice, uninfluenced and unawed, adopted upon full investigation and mature deliberation, completely free in its principles, in the distribution of its powers, uniting security with energy, and containing within itself a provision for its own amendment, has a just claim to your confidence and your support. Respect for its authority, compliance with its laws, acquiescence in its measures, are duties enjoined by the fundamental maxims of true liberty. The basis of our political systems is the right of the people to make and to alter their constitutions of government. Alright, Washington has hammered home the importance of unity. Anyone reading his Farewell Address up to this point should fully understand that Washington holds little hope for the survival of America if we are not fully united on the basics of freedom and law. Now we start getting into the good stuff. 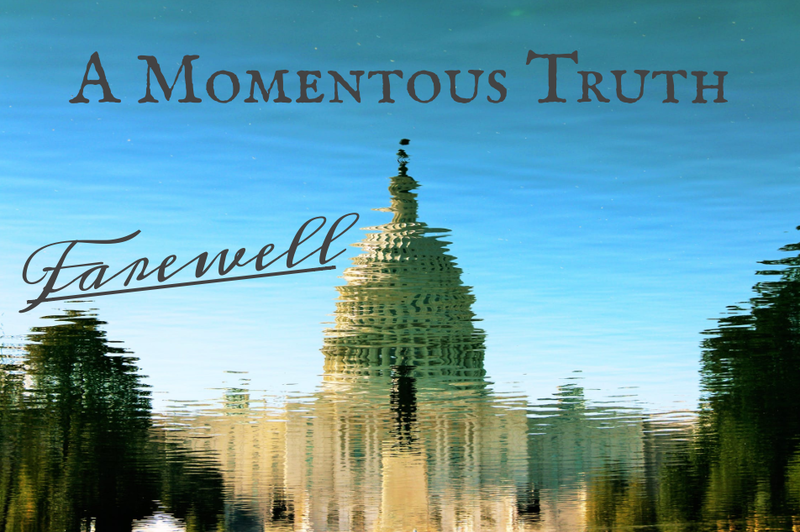 This “momentous truth”, the indespensableness of a permanent union of the whole, is one of the reasons why Washington was a big supporter of the new Constitution. He had seen firsthand how ineffective and wasteful the Articles of Confederation had been. The new Constitution was better suited for a government that required unity. Washington is about to lay out one of the best arguments ever made for the US Constitution. And it is beautiful. The ratification process for the Constitution took a long time. 10 months of debating, examination, and deliberation until finally the necessary 9 out of 13 states ratified a new governing document for the young America. Since it’s ratification 230 years ago, it has only been modified 27 times total (17 if you don’t count the Bill of Rights). Just take a moment and think about that. This document, hammered out in the muggy heat of a Philadelphia summer, was about as close to perfect as mortal men could hope to get. Washington praises it as “free” in its principles and distribution of powers. In other words, the whole thing was designed around maximizing liberty. He says that it strikes that delicate balance between security and energy, or to say it another way, the Constitution protects our rights while at the same time gives us a government that is able to fulfill the necessary functions of a government. One of the principles installed directly into this new Constitution was a process for its own amendment. This was largely a new way of doing things. Despots rarely make allowances for changes to their policy. Monarchs rarely give their subjects a say in changing the process. Yet in America, things were going to be different. For these reasons, Washington believed that the new Constitution had every reason to inspire confidence and merit wholehearted support. After laying out these reasons, Washington kicks things into overdrive and gives one of the best explanations for why the Constitution must be followed. Washington reminds the people of America about one of their first founding documents – the Declaration of Independence. Washington goes so far as to say that this is the basis for our political system. The right of the people to get rid of what is not working, and replace it with what will work. Not through violent revolution, but by following the rules laid out in the Constitution itself. Right now, many people are getting fired up. They are all about burning it down, destroying the system, sticking it to the man. However, they would do well to listen to Washington’s next words. The next sentence starts with “but”. Washington is shifting gears, everything up until this point still remains valid, however Washington is about to put a qualification on it. There is a process for changing the Constitution. But until it is changed by an explicit and authentic act of the whole people, it is sacredly obligatory to everyone. As the supreme law of the land, nothing could make more sense. In the Constitution is a method for changing the Constitution. But unless that method is followed, unless the people have made that explicit and authentic act, then the Constitution as it now stands must be respected and followed. There can be no liberty without law. There can be no law without obedience. Through the Constitution, America’s form of government was established. With 27 minor changes, that form of government remains the same today as it was 230 years ago. The very fact that we have a power and right to establish a government for ourselves means that we must obey the government that we have. This system preserves liberty because baked in is the ability to alter or abolish in order to make our freedom secure. Washington, the Father of our Country, was also the President of the Constitutional Convention. So we don’t have to wonder if he knew what he was talking about.